Hello everyone! 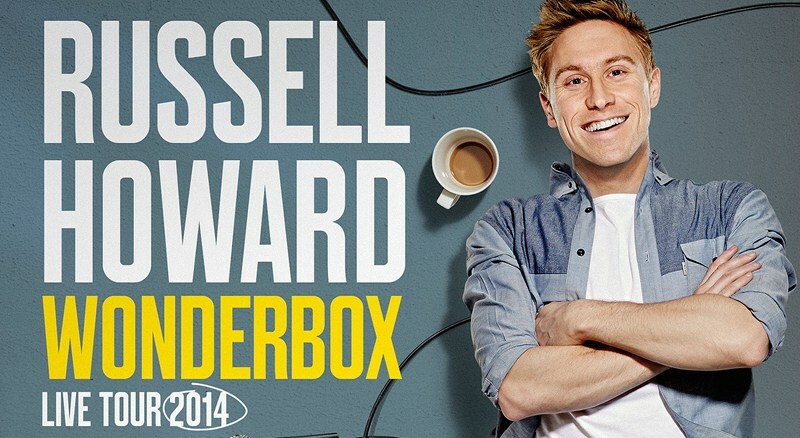 Last night, me, Ryan (my boyfriend) and my friend Katy went to Russell Howard’s Wonderbox Tour in Birmingham at the LG Arena. I booked the tickets last year, and have been excited ever since they were first booked. We started out by heading to Nando’s in the Bullring. There was a very long wait for the table and I was completely stressing about the time! We ordered then waited for our food, and it arrived about 10 minutes before we had to leave. I’ve never eaten Nando’s so quickly in my life! Butterfly Chicken and Chips…mmm! We then practically ran through the Bullring to New Street Station to get the train, we got to the platform just as it arrived and hopped on finally feeling relaxed about possibly getting there in time. When we got off the train, it was like a huge rush to get in the arena but after having unlimited drinks in Nando’s we were all desperate for the toilet so we HAD to go before we found our seats! We were all amazed we were sat in our seats before Russell Howard came on, and could finally breathe easy and have a laugh. Russell Howard was absolutely hilarious, the whole show he’d put together made our jaws and stomachs ache from laughing. You can tell from his shows that he is a genuinely nice guy, especially in the encore where someone asked if he could ring their sister-in-law, which he did while on stage, unfortunately she didn’t pick up but she was left a lovely voicemail! At the end, he spoke of an inspirational story about a boy he knew who had cancer – and brought him out on the stage. Everyone began clapping and stood up for him, it was absolutely amazing. Overall we had a great night, and we’re still laughing at the jokes made yesterday! I would completely recommend seeing his stand up, so whenever he next tours or if you are due to see him, you are in for a treat.